There's no need to wait for a special holiday to enjoy a turkey dinner fresh from the oven. You can roast a turkey tenderloin any time of the year without all the fuss of preparing the whole bird. 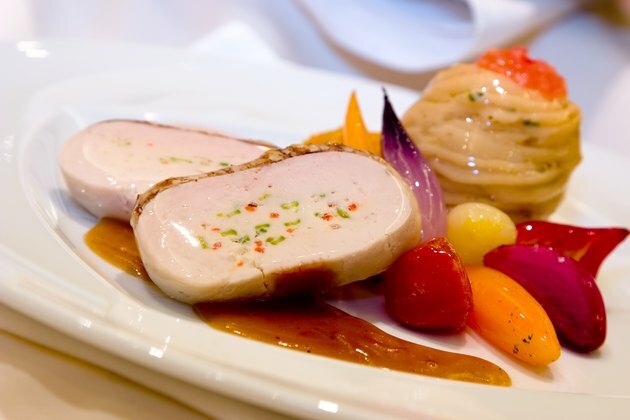 Turkey tenderloin is a boneless and skinless cut of white meat from the inside center of the turkey breast. You can purchase it fresh or frozen, either plain or seasoned with herbs such as rosemary, lemon and garlic. While turkey tenderloin is a grilling favorite, you can also make it right in your oven. Remove the plain, fresh turkey tenderloin from its package. One package contains up to three strips of meat. Rinse the tenderloin carefully with cold water, taking care not to cross-contaminate anything with the splatter, as any packaged raw turkey product may contain bacterial contaminants. Brush each turkey tenderloin generously with olive oil and then season to taste with salt and ground black pepper. The olive oil helps the seasonings adhere to the tenderloin and gives it a crisp, brown coating while cooking. Arrange the seasoned turkey tenderloin in a large baking dish. Pour 1 cup of reduced-sodium chicken broth around the bottom of the meat, taking care not to wash off the seasonings. Roast the turkey tenderloins in the oven at 400 degrees Fahrenheit for 25 to 40 minutes. The exact cooking time varies by how many tenderloins you're cooking at one time. Use a meat thermometer to check the internal temperature. To be thoroughly cooked, the center of the turkey tenderloins should reach at least 165 degrees, according to the U.S. Department of Agriculture. Remove the pan from the oven using pot holders and set aside. Allow the turkey tenderloins to rest for 10 minutes. Use a sharp knife to slice the tenderloins into 1/2-inch thick medallions. Place the meat on a platter and serve. When purchasing the meat, figure one 16-oz. package of turkey tenderloin for every two people. You can prepare an entire meal in one pan by adding sliced carrots and new potatoes to the baking dish with the tenderloin. Use different types of seasonings and liquids to spice up your turkey. Try rosemary, garlic, lemon pepper or sliced shallots or substitute dry white cooking wine or barbecue sauce for the chicken broth. Undercooked poultry can cause foodborne illness, so be sure your turkey reaches a minimum of 165 degrees Fahrenheit. Insert your meat thermometer into the thickest part of the turkey tenderloin to check the temperature.